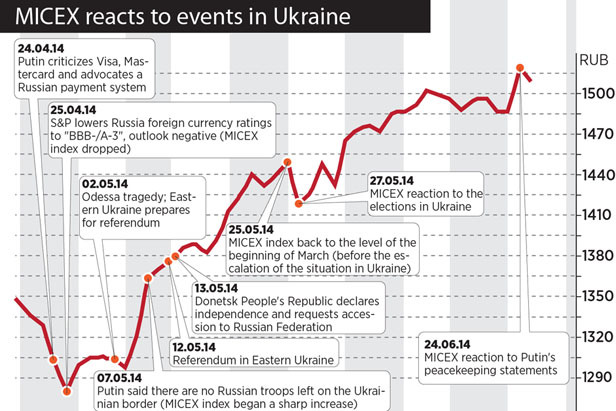 Take a look at the correlation between the movement of stocks on Russia's MICEX and the political events in Eastern Ukraine between April and June. In early March, the MICEX fell by a record 200 points after militias in the Eastern Ukrainian cities of Lugansk and Donetsk hoisted Russian flags over government buildings. The index managed to recover only in late May, after numerous statements by Russian President Vladimir Putin supporting the efforts to reach a peaceful settlement in the region. On June 24, Putin asked the upper house of Russia's parliament to remove the authorization it had granted in March for Russia to intervene militarily in Eastern Ukraine. By late June, the MICEX index had recovered to the levels it posted in early December, before the rallies erupted on Kiev's Maidan.